Battle of the Egadi Islands: Fought on March 10, 241 BC between Carthage and Roman fleets. 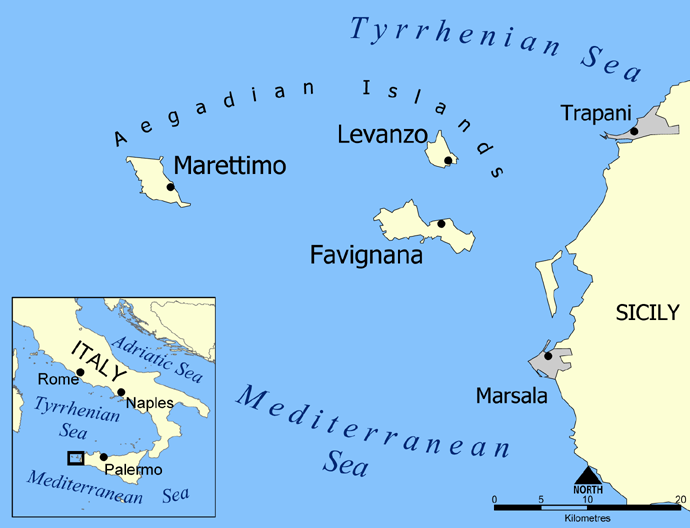 The Battle of the Egadi Islands (Battle of the Aegates) was the last major naval conflict between the powers of Carthage and the Roman Republic, circa 241 BC. More than 100 ships sunk and more than 10,000 men died during the battle. Our mission is to salvage and locate the remains of the battle: bronze rams, helmets, shields and part of the ships using 3D photogrammetry and 3D model reconstruction in order to create a first digital underwater map of the site. The Battle of Egadi is part of a big underwater archaeological project currently running in Sicily with the aim to create the first digital underwater map of this particular cultural heritage. Watch GUE instructor, Gideon Liew talk about the Battle of the Egadi Islands mission. A total of 30 research divers from Global Underwater Explorers (GUE) took part in the 3 weeks of operation. The use of divers proved to be a very effective integration to the instrumental researches carried out from surface and brought several new important findings. The direct presence of properly trained and operational humans on the sea floor made a difference in spotting artifacts, especially in rocky areas where artifacts encrusted by marine life become virtually invisible to any means of surface electronic investigation. The use of a team of divers on the bottom also allowed the implementation of additional means of investigation, including metal detector surveys, extraction of core samples from the bottom, and dynamic prospections of teams using diver propulsion vehicles (DPVs), providing close and effective inspection of relatively vast areas of the sea floor. A number of prospections of the sea floor were executed by team of divers using DPVs. Divers started from a given reference point, such as the position of a ram or other finding, and deployed cave line (knotted every 3 meters) while navigating, in order to maintain a precise sense of the area explored, to facilitate the survey of artifacts encountered, to ensure ability to locate the artifacts on subsequent dives, and to allow the team to get back to the starting point for ascent and decompression. Prospections were around the positions of ram #9, ram #12, ram #13, and ram #6. Most of the findings during 2017’s campaign were the result of such prospections.